After having failed in spring 2012, it was about time to come back to rig the “BIG”- Line again. There was no more beautiful and alpine place to rig this, the world's longest, 110 meters long polyester highline than the Mandelwände in the Hochkönig area. Back in the days this was only a few meters shorter that the high tech record. On September 1st Clemens, Johannes, Mirko, Klaus and me went to the mountain Hochkönig (Austria). This time not only to rig the 110m long “BIG” line again but also to prepare our slackline festival that was going to take place the following weekend. While the preparations for the Raiffeisenclub Slackfest Hochkönig ran at the Arthurhaus, Clemens, Klaus and me started the ascend to the spot of the BIG line which is located at an altitude of 2500 m. The first 700 meters of the totally 1000 meters of difference in altitude lead over steep slopes covered with a layer of grass which is strenuous to walk. However, the most exhausting and dangerous part of the climb are the last 300 meters difference in altitude which lead through an about 60 degree steep gorge. Here there is also some climbing involved and there is a high risk of rock falls. In recent years there have been several casualties in this part of the Hochkönig region. So we had to be really careful and focused. When we had rigged the line in May for the first time there was still snow. 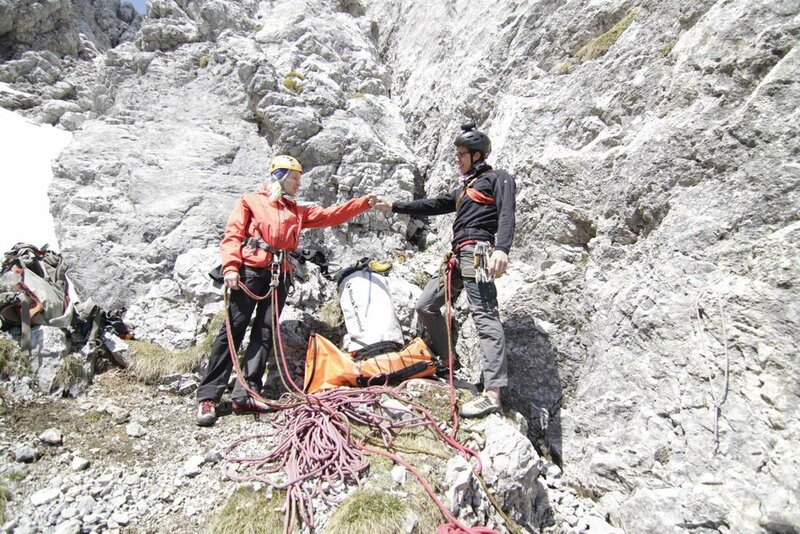 Once wehad secured the gorge with 400 meters of fix ropes, we saved a lot of time and energy ascending and descending. Together with the ropes for the connection we needed altogether 700m of ropes. Of these we could save 500m this time, so that we could fit all the material in only “three not too heavy” backpacks. 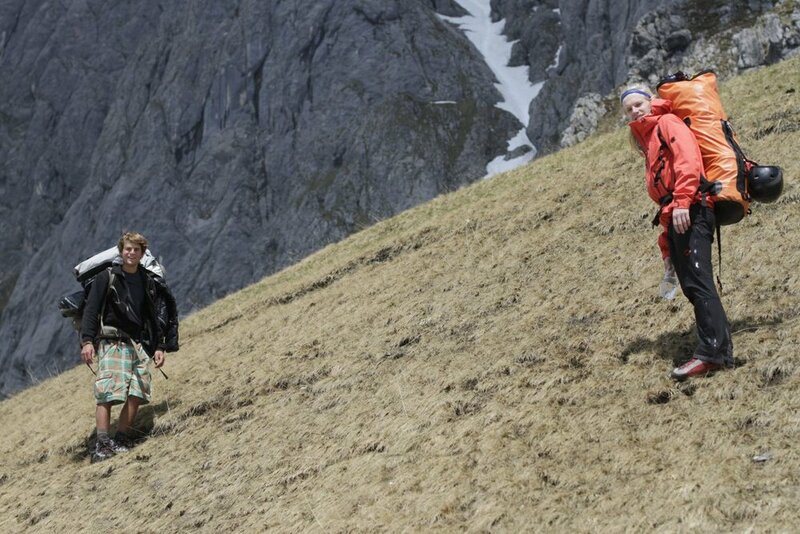 The whole ascend was still a very strenuous undertaking. Arriving on the ridge we split up. Clemens started to make the connection in the canyon; Klaus climbed the 100 meters difference in altitude to the peak of the “Schneeklammköpfe” to throw a 135m long rope from there down into the gap. Meanwhile I climbed the other fixpoint – devil's tower – to throw down a rope as well and built the anchor. When I had finished, I hurried to the other side where there was the spot where the rope was tightened to help Klaus who had abseiled on the connecting line as it had got stuck in the rocks. In the meantime Clemens had made the connection in the gorge so that I could pull up the ropes tied together. As soon as I had finished that, we already had to start the descent again to avoid hiking in the dark. On Monday I hiked up with Hannes. After both anchors had been finished and the line had been pulled across the gap we could have tightened the line, but unfortunately we dropped a piece of the banana. So we had to let the line hang slack and return the next day with a replacement. On the 3rd day Charlie who arrived that morning with Anatolij ascended with us. Due to the fact that we set off late, we arrived at the top only at 3 pm. I had to climb the devil's tower to finish the backup anchor. Then Charlie and Hannes started tightening the line. I came over to them and finished tensioning with Charlie. After having done a few smaller jobs like padding the line was finally ready to be walked on one hour before sunset. The motto now was: On the line and testing! Although the setup was five grams per meter lighter than at the last setup each of my tries ended after less than 10m. The orientation was very bad, the gray rock of the devil's tower didn't stand out clearly before the gray rock behind and the sun was standing exactly in walking direction, so that it blinded me and my fix point was in the shadow. I even had a leash fall only 5m away from the anchor and ripped away the blisters on my feet which I had from the hike up. We did not have any plaster with us but luckily Hannes had THE idea: Taping a banana peal and a paper tissue on the bleeding heel. With that the descent was more endurable than with any high tech plaster. The next 3 days we all were busy with the preparation of the festival. Our biggest problems was the lack of natural anchor points as well as the fact that there was hardly any level ground area. Thanks to Mirko's ad hoc produced A-Frames and Peter Radacher's equipment (one digger for the trick line, two tractorsfor the long lines and one wheel-type loader for the house highline) we could rig all of the planned lines nevertheless. When the festival was in full swing on Saturday noon, I hiked up to the BIG line spot alone. After arriving at the top shortly before 3 pm, I first had to re-tighten the line all by myself, which was really hard work. But after one hour the line had a tension of 1.2 tones. 400 pounds more than I actually wanted, but changing it would have taken too long because time was running out: It again was only one hour from sunset and Michael Radeck was waiting to film with his “Hexakopter” aircraft from the air. So on the line with me. Using the line slider I went to a third of the line and tried the way back from there to get used to the line. I got along better than expected so that I walked this part three times. At the third go the “Hexakopter “ hit the ground due to a magnetic field disturbing its orientation. My orientation was also not the best when I tried to walk from the middle towards devil's tower afterward, because the low sun was blinding me and I was exhausted. As it was getting dark, Michael did not hike down with Clemens and Steff as we had planned but stayed with me for safety reasons. Meanwhile Christian Kruse had arrived in the gap for staying with us there overnight. On the next morning I took it easy and talked a lot with Michael and Chris, so that it was 2 pm till I finally hiked up to the anchor at theSchneeklammköpfe. As the tension was still OK, I started immediately. Like the day before I stood up at a third of the line and at each try I rolled farther out till I started walking nearly from the middle and managed to walk it from there to the end without falling. That gave me the confidence to know that I was able to walk the line all the way. So I rolled over to devil's tower to try walking the whole line in the direction towards the Schneeklammköpfe. As expected I had a much better orientation than at my tries from the other side. Nevertheless the first half was much harder than the second and after the first third I reached the hardest point where I fell after a controlled and calm start. However, my calmness was gone for now. I needed several tries to stand up there and then I was able to walk the next 10m, after which I fell again. However, from now on I found the calmness to walk the rest of the line. Having walked more than half of the line in one attempt, gave me the certainty that I was able to walk the whole line if only I stayed relaxed and focused enough. For the next try I regain new energy by eating something and taking a rest for half an hour. Meanwhile I also make my inner self as calm as possible. Finally I stretchand I now feel quite rested, relaxed and ready to give everything. I roll to the other side again and stand up with an electro song in my ears. I have to catch immediately. After changing to the same song which I also listened to on the 119 m highline in the USA, I hope things will work out. The regular beat pushes me and gives me the necessary concentration on the right reaction to movements of the line. The trick is to let sideways movements of the line happen instead of fight them, and that applies toevery single moment! Reacting the wrong way once leads to a fight with unsure outcome. However, this time I reach the middle without any incidences. Yet hardly there, I lose my balance and have to fight until the line is steady again. “Man, that was close! But don't think of falling, but only of how you have to move!” I tell myself at that moment. The same thing happens two more times as I am not concentrated 100% on walking anymore but rather think of arriving. Luckily, I can get the line under control again and when I arrive at the anchor, Hannes has been waiting for me there and we shout our joy out loudly. All tension leaves me, I am happy and relieved. I can feel a satisfying peace and calmness. For de-rigging Hannes has to go onto the devil's tower. We drop the line with backup, pulling it up would be too exhausting. Anatolij arrives at the exactly right moment so that he can already start putting the line together. As the line gets stuck in the wall this is way harder than thought. Hannes and me meet him at nightfall and help him. The following descent through the darkness was dangerous and took long. At 11 pm we finally arrived at the Arthurhaus where my girlfriend Tereza was waiting for us with a bottle of sparkling wine. A huge thanks to everyone who was involved and helped realizing this project! Clemens has earned many kudos by enduring one week of annoying calls and emails from the authorities complaining about the line and managed to calm them down. My compliments to the “Hexakopter” pilot Michael Radeck who risked his material and life to get beautiful footage from the air. Special thanks go to Marinus and Steffen for helping Michael and his hexakopter with the ascent and descent. Last but not least many thanks to Elephant Slacklines for the great Bluewing webbing and the 135 m long rope.